My friend and occasional co-author Jay Levinson just passed away. He was eighty. 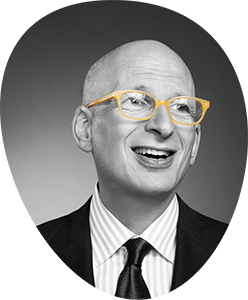 Jay helped invent the idea of the modern marketing book, pioneered Guerrilla Marketing (which has nothing to do with gorillas and everything to do with thinking independently and bravely) and influenced several generations of leaders. But most of all, I want to thank Jay for living a generous life. He never kept a secret, never hesitated to teach, to point something out, to lift someone up. Jay was at his best when, with a mischievous smile, he'd answer a question, turning a newbie into an expert with one of his many lists or with a clever story. The point of his many, many books wasn't that there was a formula to follow, but that there was an attitude, an attitude that could help just about anyone make a difference. The core of that attitude was the lighthearted application of generosity, for no other reason than it was the right thing to do.